This is a gorgeous, creamy, unexpected and comforting pasta dish. I love the flavour combination of butternut squash, bacon, maple syrup and cheese, but the secret ingredient is that little bit of nutmeg. Elegant enough to impress your guests but easy enough for a weeknight meal. You can even make the sauce ahead of time for an even easier meal. Enjoy! 1. Heat oil in a large skillet over medium-high heat. Add bacon, reduce heat to medium, and cook, stirring occasionally, until crisp, about 6-8 minutes. Transfer bacon to a paper towel lined bowl and set aside. 2. Add butternut squash, onion, and garlic to skillet and season with salt and pepper. Cook the vegetables, stirring occasionally, until onion is translucent, 8–10 minutes. Add broth and bring to a boil, reduce heat, and simmer until squash is soft and liquid is reduced by half, 15–20 minutes. Let it cool slightly, then purée in a blender until smooth. Stir in the maple syrup and nutmeg. Season with salt and pepper to taste. Return the sauce to the skillet and keep warm. 3. Cook the pasta in a large pot of boiling salted water, stirring occasionally, until al dente. Drain the pasta, reserving 1 cup pasta cooking liquid. 4. Combine the pasta, butternut squash purée, and 1/4 cup of the pasta cooking liquid in the skillet and cook over medium heat, tossing and adding more pasta cooking liquid as needed, until sauce coats pasta, about 2 minutes. Stir in the grated Pecorino and parsley. Adjust season with salt and pepper if needed. 5. 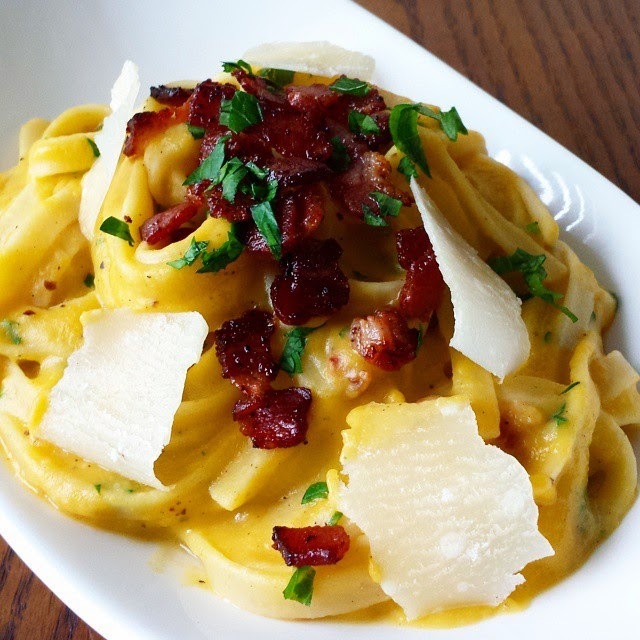 Serve pasta topped with reserved bacon, shaved Pecorino and chopped parsley.